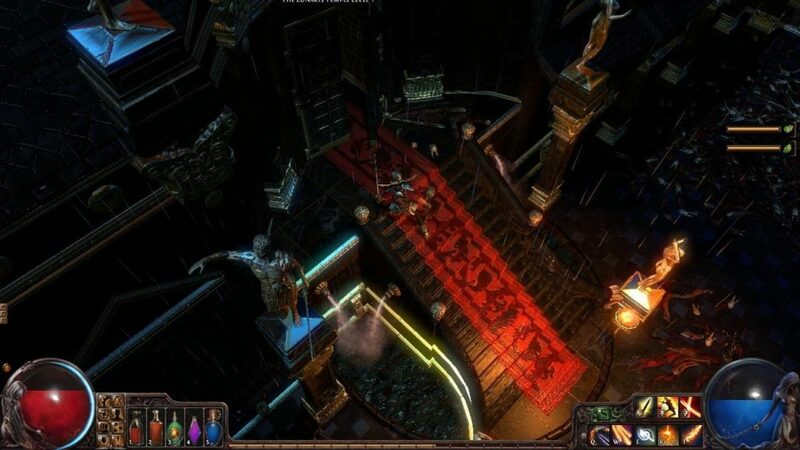 Path of Exile, Hack ‘n’ Slash recognized as the true successor of Diablo 2 by the fans, offers a new extension. This one is called War for the Atlas, and it focuses mainly on the end game content of the game. In the Free2Play MMORPG Path of Exile, it’s up to you to fight the evil in a dark fantasy world in the role of one of six character classes. Banished from your home to the dark land of Wraeclast, your job is to survive alone or with other exiles in a post-apocalyptic world. Even PvP battles are possible. To do this, from the isometric point of view, you’ll be hordes of cruel monsters, bag ever-better gear, and upgrade your heroes to take on even more powerful creatures. The developers pay special attention to a sophisticated skill system that works on gems that you can build into your equipment. The game will feature an in-game shop where you can buy new animations for your heroes, additional spell effects or social pets. This Hack ‘n’ Slash from Grinding Gear Games is expanding once again with an extension. Since its release in 2013, Path of Exile has improved with these regular additions of content. The latest one is called War for the Atlas and focuses on the mechanics of map generation. The game already offered a random map generation system when you finished the adventure. And now the principle of the Atlas is grafted on. To put it simply, a new big bad guy is coming in, the Elder. This one has the power to distort the world and to model it. The player will have to navigate in a world of randomly generated maps, to beat the four big bosses, who offer the opportunity to face the final boss. The Atlas therefore comes a little more structured procedural content and make the experience more meaningful. If you want to get cheapest PoE currency, U4GM always is the best choice for you. We guarantee that the activity is 100% real and effective. This entry was posted in Other Games, Path of Exile. Tags: Path Of Exile, Review.